Major Mint and Captain Candy watch Clara and Eric kiss. 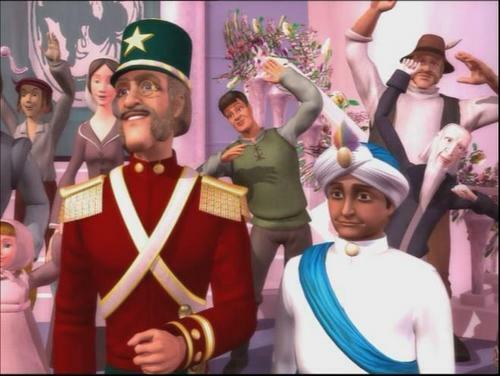 Look at that; Mint can smile, after all.. Wallpaper and background images in the Barbie in the Nutcracker club tagged: barbie nutcracker major mint captain candy. Look at that; Mint can smile, after all. This Barbie in the Nutcracker photo might contain uniform, regimentals, muzikant, bandlid, volledige kleding eenvormig, and full dress uniform. What do you reckon he'd be dreaming about? Candy doesn't seem to look as happy as the Major, does he? I don't think he's disappointed, but he does look more subdued. Maybe, he dreaming about big family? I think, if Major have a big family and beautiful wife, he will be kinder, isn't? Well, when I write for him he has a big family, and he can be a lot kinder. Maybe he's just happy for Clara and Eric.